Full scale electric powered aircraft? Yes! I am writing this on December 17th 2003, one hundred years after the Wright brothers first flew their Flyer with a home-made 12 horsepower gasoline engine. Ever since that day, full-scale aircraft have been powered by gasoline, kerosene, or rocket fuel, all of which produce a significant amount of pollution and a lot of noise. QuietFlyer readers don’t like pollution and noise, which is why we fly sailplane and/or electric models. The Silent-AE1 takes flight. At altitude, the motor is stopped, and the propeller pylon retracts into the fuselage. Photo courtesy of Alisport. Now, there are a number of full-scale electric powered aircraft projects, either completed or underway. We’ll look at two of them, and compare each to a representative model. In the early days of electric model aircraft, one of the most common uses for electric power was in sailplanes. Battery capacities were low, so an application in which power was needed for only a small part of the flight made sense. It is not surprising then that the first commercially available full-scale electric aircraft is also a sailplane, the Silent-AE1. Front view of the Silent-AE1. Photo courtesy of Alisport. Both the Silent-IN and the Silent-AE1 have the propeller on the end of a pylon that is hinged just behind the cockpit, and retracts backwards into the fuselage for gliding flight. The propeller folds, but unlike a model folding propeller, the blades fold downward instead of backward. 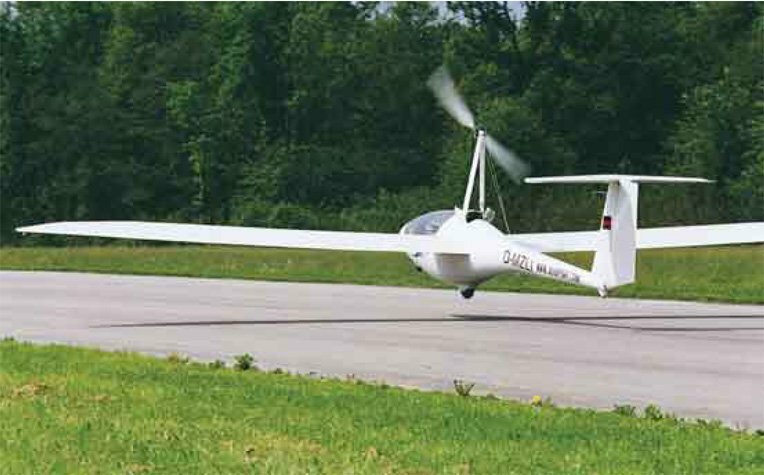 Like a model electric sailplane, full-power duration is short, at about 5 minutes. This is enough power for one climb to about 2,000 feet. In good thermalling conditions, that is high enough for a competent sailplane pilot to find some lift and have a nice long flight. Even with no lift, 18 minute flights are possible. The AE1 uses a Nickel-Cadmium (NiCd) battery consisting of 12 parallel packs of 60 cells each (for a total of 720 cells), producing 72V with a capacity of approximately 20 Ah. Doing a bit of arithmetic, one arrives at a per-cell capacity of 1.7 Ah. The battery weighs 88 lbs, which gives a weight just under 2 oz per cell (including interconnections), which suggests that 1700SCR cells are being used. Close-up of the base of the propeller pylon. 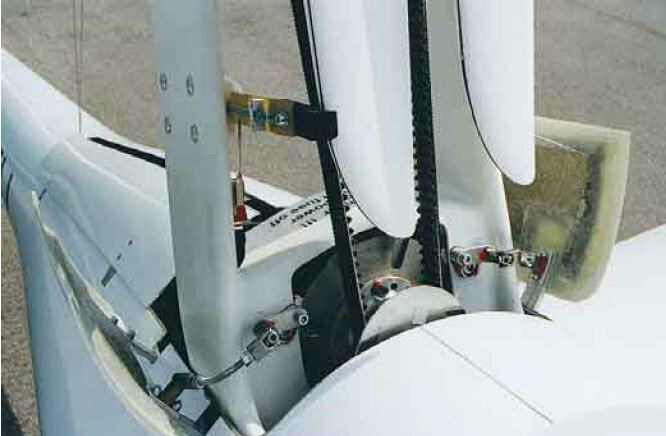 The cogged drive belt is clearly visible, as are the tips of the folded propeller blades. Photo courtesy of Alisport. 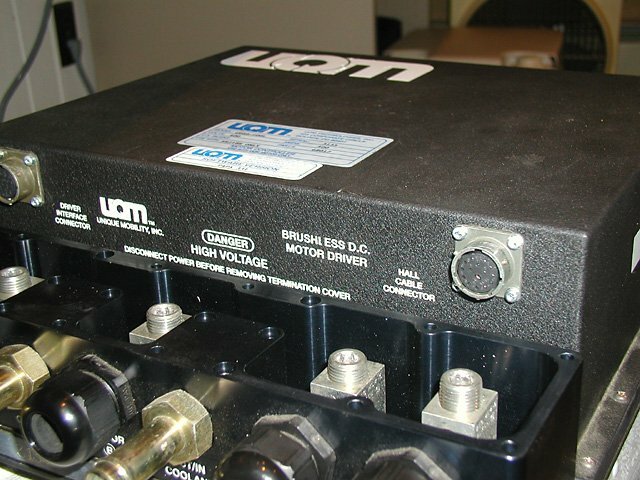 The maximum motor power input is 16 kW at 72 V, giving a current of 220 A, or 18 A per 60-cell pack. It appears that it may be possible to substitute more modern cells, such as 2.4 Ah NiCd or 3.3 Ah NiMH SubC cells, which could double the available motor run-time with little or no weight increase. The use of Lithium Polymer cells could more than double the capacity again, although that would cost a large fortune (as opposed to a small fortune for the NiCd or NiMH option). I’ve chosen a Great Planes Spectra model to compare with the Silent AE1. A Spectra typically weighs about 3 lb, which makes it approximately 1/6 scale (using the cube-root weight rule of scaling). This corresponds exactly to the ratio of wingspans (2m for the Spectra versus 12m for the AE1), confirming the choice of 1/6 as the scale factor. Another rule of scaling models (see my column, Scale Electric Design, in the October 2002 issue) is that the power-to-weight ratio remains about the same. This means that our 3 lb Spectra should have approximately 60W of power to have performance comparable to the AE1‘s. That translates into a 7-cell battery and a Speed 400 6V motor, which is much less power than even the stock power system provided by Great Planes. The AE1 uses a 76 inch propeller, which corresponds to about a 12 inch propeller for a 1/6 scale model. This means we’d need to use about a 4:1 gear ratio, and a 12×10 or so propeller, which would fly the Spectra about as well as the supplied direct-drive Goldfire motor and 8×4 propeller on six cells. This is not generally considered to be much power, but keep in mind that most model aircraft, including electrics, are overpowered compared to their full-scale counterparts. The E-Plane on the apron, with the cowling removed. Photo by M. Zborowski. The non-profit Foundation for Advancing Science and Technology and Education (FASTec) is backing the development of the E-Plane, an electric powered full-scale airplane. It is being built by James Dunn and Advanced Technology Products (ATP). Rather than starting from scratch, ATP began with a commercially available aircraft, the French DynAero Lafayette III, built by American Ghiles Aviation (AGA). The Lafayette is a modern two-seat carbon-fiber aircraft, normally powered by an 80 horsepower Rotax 912 engine. The airframe is very low in drag compared to more traditional two-seaters like the Cessna 152. The Lafayette can cruise at about 140 knots (160 mph or 258 km/h), whereas the 152, equipped with a 110 hp Lycoming engine, cruises at only 95 knots (110 mph or 176 km/h). For the E-Plane project, AGA constructed a custom Lafayette with battery compartments in the wing, no engine, and no fuel tanks. A close-up of the motor compartment. The motor is on the left, and the fuel cells are just visible on the right. The speed control will be installed above the fuel cells. Photo by B. Miller. At the time of this writing, the rate of climb for the E-Plane was not yet known. The plane has undergone taxi tests using a 270V Nickel Metal-Hydride (NiMH) battery with approximately 18 Ah capacity. Hopefully, the E-Plane will have flown successfully by the time you read this. The development plan calls for initial flight tests to be done with a Lithium-Ion battery of significantly higher capacity, giving the airplane a range of approximately 100 miles. The final power source is to be a hydrogen fuel cell combined with a Lithium-Ion battery. The fuel cell will provide continuous power to give a 500 mile flying range (comparable to that of most combustion powered light aircraft). The Lithium-Ion battery will act as a buffer battery for short term bursts of full power, such as would be used during take-off and initial climb-out. 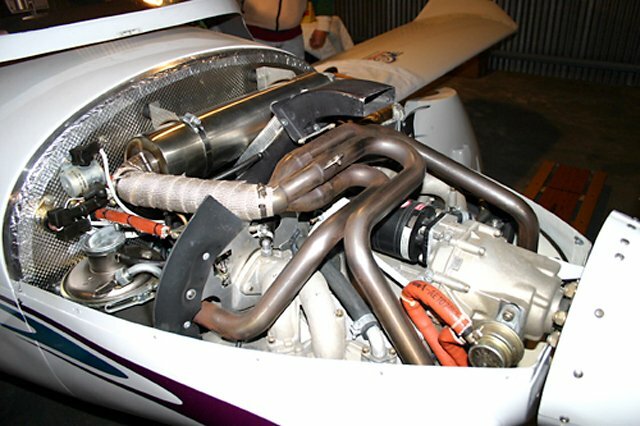 For comparison, this photo shows the Rotax 912 80hp engine installation. Photo by B. Miller. The motor used in the E-Plane is the EV218 brushless motor from UQM Technologies Corp., which is basically a very large version of the brushless motors many of us now use in model aircraft. Full throttle current is about 250A, and the speed control can handle 400A. The motor is optimized for high torque at low rpm, eliminating the need for a gearbox. The motor and speed control have a combined efficiency of about 92%. The propeller is a 68 inch, in-flight electrically-adjustable variable pitch three-bladed propeller made by Airmaster. By changing the pitch, the propeller can be optimized to minimize the power requirements during both climb and cruise. The big "if" in the E-Plane project is the availability of a fuel cell. This is currently a hot research topic, and if a powerful and affordable fuel cell could be developed, it would revolutionize transportation. Electric cars would be much more practical than they are now, and an electric plane such as the E-Plane would have enough range to be useful. This is the 400A speed control used in the E-Plane. In addition to the connectors for the motor power leads, there is a plug for the Hall sensors, another to interface to the throttle control in the cockpit, and an inlet and outlet for liquid coolant. Photo by B. Miller. Unlike a battery powered plane or car, a fuel cell powered vehicle is not charged electrically, but is filled with hydrogen fuel. But, instead of burning that fuel in an engine (which is also a possibility), it reacts with oxygen in the presence of a catalyst, producing electricity and water. The catalyst, unfortunately, contains platinum, which is one of the most expensive substances known to man, hence the high cost of fuel cells. First, from reading Table 2, it’s obvious that the E-Plane‘s power-to-weight ratio of 50 W/lb is within the range of normal for a reasonably well performing electric model. If we were to build a 1/6 scale model, it should weigh just under 5 lb, and require 250 W of power. A 10- to 12-cell battery pack and a suitable brushless motor would be ideal, and would result in a model having similar performance to a battery-powered full-scale E-Plane. A possible power system would consist of a 10xCP2400SCR battery, Jeti Phasor 45-3 brushless motor, and an 11×7 propeller (which is approximately to scale). Perhaps someday, fuel cell technology will trickle down to us modelers, and we will be able to get rid of our heavy field charging batteries in exchange for a small cylinder of hydrogen from which to refuel. Just as fuel cells will make electric cars as practical as gasoline powered ones, fuel cells could make electric model aircraft be equal to glow models in every aspect (although they are already close enough for most practical purposes). The Silent-AE1 and the E-Plane are two very different full-scale electric aircraft. The Silent, like an electric model sailplane, only uses power to achieve a launch. As with any motorglider, a benefit to the pilot is that she need depend on a tow plane and its pilot, or a winch and its operator. An additional benefit, brought on by the use of electric power, is that the aircraft is quiet, allowing it to be launched even in places where noise regulations prohibit other powered aircraft (like tow planes or combustion powered motorgliders). This is a big concern in the Silent‘s home of Italy, and in other European countries. What I find most interesting about the Silent is that it’s power system is relatively low-tech. The motor is an off-the-shelf DC motor, and the battery is constructed from readily available NiCd cells (albeit, a large number of them). The power system is basically a scaled up version of what we have been using in the hobby for years, and is not terribly expensive. The E-Plane on the other hand is attempting to achieve with electric power that which has been the domain of gasoline piston engines for decades: extended cruising flight in a personal aircraft. Such a plane could be built using inexpensive off-the-shelf components, and it would fly, but range and duration would barely be adequate to complete a single circuit of the airfield. Instead, the E-Plane is relying on the latest technology, some of which is still immature. It uses a state-of-the-art brushless motor and controller. Until the fuel cells become available, power for flight is being supplied by a Lithium Ion battery, giving sufficient duration for at least some meaningful test flights. 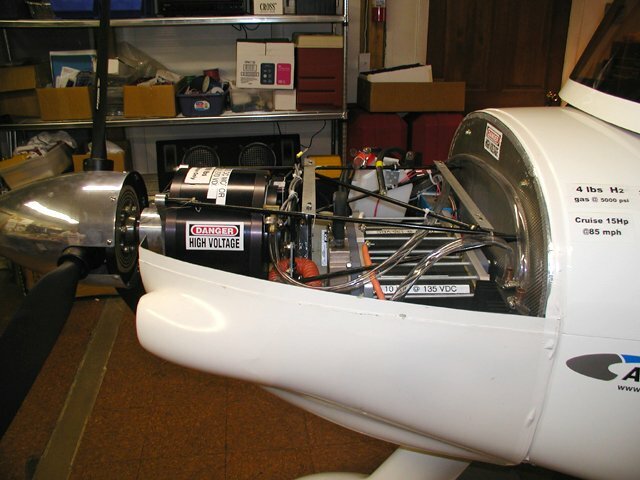 A variable-pitch propeller squeezes the most out of the power system (waste not, want not). The drawback of all this high-tech equipment is cost. 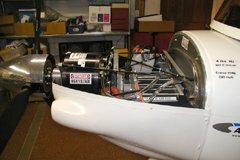 The motor alone costs $15,000 at the time of this writing, and the cost of experimental fuel cells is still prohibitive. However, once this technology becomes commonplace, prices should drop dramatically. 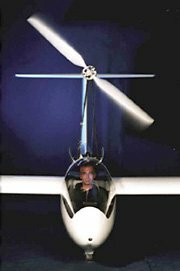 You can find more detailed information about these full-scale electric aircraft on the web. The Silent is described on Alisport’s site at www.alisport.com. The E-Plane had its own web page at www.aviationtomorrow.com, although this now appears to be defunct. It was also covered in a series of three articles in Kitplanes magazine. can i get the latest specs of motor and battery of electrict aircraft available in the market now? I haven’t looked into this lately, but if you search Google for electric airplane, you should find lots of information. I liked your artical on the E-Plane. Adding the high cost of using fuel cells with a electric motor,defeats the purpose of getting rid of using fuel. What you need is to do is to recharge the planes batteries while you are actual flying,thereby increasing the planes long distances by a lot, if not unlimited. The way to do this is to use the wind power that is blowing against the plane to generate electical power to replenish the batteries. *** Stick your hand out of the car window while you are driving,FEEL the power of the wind. Note**this could be used in Cars,motorcycles and Drones as well. I would like to hear your opinion on this idea before I give out my whole plan on how to do this. Alvey, you can save yourself the trouble, since your plan won’t work. It’s called the “law of conservation of energy”. Anything you stick out into the “wind” is going to cause the engine to have to work that much harder (and thus use more energy) to make up for the extra drag. Remember that the “wind” is only there because your engine is working hard to make that perceived “wind” (by virtue of moving the vehicle through the air). In the very best case, where your engine, generator, and batteries are 100% efficient, any such scheme will have NO effect on range. In the real world, where things are less than 100% efficient, any such scheme will merely reduce your range, requiring you to recharge more often.